BoingBoing and several other blogs have picked up a story today about a hen in Mexico that lays green eggs - as if nobody's ever heard of such a thing before. I've been familiar with multicolored hens' eggs since childhood. We always kept Araucana hens, partly because the eggs are so pretty and partly because they and their roosters are very mellow and non-aggressive. 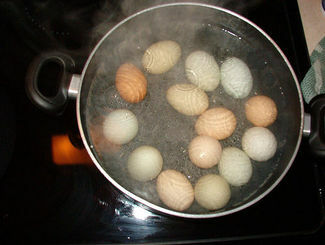 Their egg shells range in color from an almost olive green to lighter green to pale blue. The insides are the same as any other egg. It's a little difficult to tell because of the boiling water, but there are green, blue, pink, brown and white eggs in there. Fun, huh? Part of me really wishes that I could build a chicken coop in my yard and keep hens for the eggs. However, it's not legal in the town where I live. Add to that the number and variety of predators that I regularly see roaming the yard and it would probably cause me more angst than it's worth anyway. I do enjoy farm fresh eggs, though. I watched an episode of "Mythbusters" the other day in which they investigated the idea that turning a light on and off uses more energy than keeping it on. It turned out that turning on a light bulb only uses a few seconds' worth of energy, so it's always worthwhile to turn off a light when you leave the room. You see where this is going, don't you? Now I've suddenly turned into our household Light Patrol Officer. It's only taken a few days for it to rub off on my husband, though. Now when I get up there's usually only one light on in the living room rather than the heretofore customary three. The only exception is our porch light, which I leave on all the time because it's usually still dark when I leave the house and dark again when I get home. I'd get a light sensor for it (again), but the fixture is barely large enough to accommodate an outdoor CFL as it is. My next training initiative for my husband involves the proper use of a chip clip. When he closes a bag of potato chips, he'll fold it over and put the clip at a jaunty angle on one corner, leaving a large area through which air can get in. Even when I put it on the right way, he'll open the bag and replace the clip his way. I wonder if I can get some subliminal message CDs to play while he sleeps? Finally, I am seriously tired of the cold weather. I know it's only January, but I've had enough already. Unfortunately, we have at least two more months of this to go before it warms up for spring. Did I mention that my gas bill for this month was $100 more than the one for December? Grrr. Well, I'm starting to ramble and I think I just heard Velcro yakking in the kitchen, so I guess I'll go clean up cat puke and get ready for work. You're jealous of my life, aren't you? Average Jane's Going to BlogHer! I have about five minutes before band practice, so I figured I'd check in to report that I'm officially registered for BlogHer '08. Naturally, I didn't want to break my 100% streak, so this'll be my fourth one. I know Liz is going. She's the first person I met when I arrived at the very first BlogHer Conference in 2005. I'm rooming with Rita again, as I did at Blogher '06. We're planning another late Saturday night wind-down watching nature shows in our room. Are you going to be there? Let me know! If you're attending any other social media conference(s), let me know that, too. I may very well attend more than one this year. I have a short list, but I'd like to hear what everyone else thinks is valuable. One of our guitarists is here...gotta go! I was tagged by Bea to participate in this, so I've quickly thrown together a photograph displaying my horrible handwriting. 1. 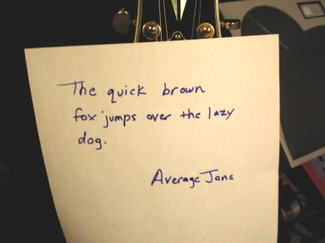 Choose a pangram of your liking. 2. Write it on a piece of paper and sign it with your blog name or online handle. 3. Take a picture and post it to the flickr group, your blog, myspace, facebook or all of them. 4. Link back or trackback to Logtar’s post. I'll let y'all tag yourselves for this one. I hate to put any pressure on people at the crack of dawn on a Monday. As I wrap up another ridiculously busy week, I've decided to use today's blog post to encourage any of you who enjoy cooking to enter Pensieve's Snackalicious Super Dishes recipe contest. It's for any recipe that would be a crowd-pleaser at a Super Bowl party. I entered my Pomegranate Salsa recipe because I love it so, even though it's already getting a little difficult to find pomegranates at the grocery store. I'll bet Whole Foods still has 'em, though. That's all I've got for now. I'm headed out for a coffee-free Coffee Morning, followed by another busy day at work with a welcome break in the middle because it's our monthly Indian Lunch Club day, in which a group of my coworkers and I visit a delicious Indian restaurant with an extensive buffet. Why am I still sitting at the computer in my freezing home office? This sounds like a day worth starting immediately! It's been almost eight months since I gave up caffeine. That's got to be a record for me, but I don't see myself going back to it again this time. It's really freeing to not be addicted to anything. Caffeine was definitely an addiction for me - I can tell because when people find out I've stopped drinking it, they say stuff like, "Wow, and you drank a lot of coffee!" We won't even mention the amount of Red Bull I drank. I know I'm saving a ton of money, too. No longer do I find myself drawn into coffee shops only to walk out $5 poorer. And Red Bull costs at least $2.00 a can, even in cases. I'm also much happier with the beverages I do drink, particularly because the coffee at my office was terrible. The most interesting thing about my caffeine cessation is that it turned out I didn't need it the way it made me think I did. I was convinced that I couldn't be happy, productive or energetic without a little caffeinated intervention. It turns out that I pop awake in the morning and go about my day just fine with water alone. Best of all, I no longer have that daily headache and energy dip around 2:30 p.m. I still love the way coffee smells, but I don't have any urge to drink some. Like an ex-boyfriend whose redeeming qualities were outweighed by his negative ones, caffeine and I just weren't meant to be together. We have an audition set up for next Tuesday, so we're hopeful that that'll be that. I'm sure it won't be so simple, but I like to be optimistic. That's really the only thing that's happened since I last posted, unless you count making sloppy joes for dinner and sleeping. Sometimes my life really doesn't warrant a blog post. Wow, what a shock about Heath Ledger dying at 28! Sounds like an overdose, too, which is even more unfortunate. Here's my review of A Knight's Tale that I wrote in 2001. Heath was definitely the best thing about an otherwise weird movie. 1. What do you like about being a man? 2. What don't you like? 3. How do you feel about being a man in our culture? 4. If you could magically make one thing better for men, what would it be? 5. What would you like women to know about being a man that you think they might be unaware of? I have today off for Martin Luther King Jr. Day, so the weekend isn't really over for me yet. However, I figured I might as well wrap up the part that's already taken place. On Saturday night, my husband and I joined my sister and brother-in-law at a Brazilian barbecue restaurant to celebrate my brother-in-law's birthday. If you've never been to a churrascaria, it is a carnivore's dream. You start by visiting a bar filled with salads, soups and side dishes. It is advisable to eat extremely lightly at that juncture because when you're finished, the meatfest begins. You're given a two-sided token to place beside your plate: the green side means "offer me meat" and the red side means "I need a break." Waiters come around with long swords on which are skewered various roasted meats, and they either pull off individual portions or give you slices from larger cuts. Our restaurant had fifteen different cuts and kinds of meat. I tried numerous cuts of beef, bacon-wrapped chicken, and pork tenderloin. It didn't take long for me to get full, so I never got to the Brazilian sausage. There were also some standard side dishes on the table. In our case it was fried polenta, garlic mashed potatoes, cheesy biscuits and fried bananas with cinnamon. Afterward, we went to see "I Am Legend," which was a bit scarier than I expected even though the monsters had physics-defying characteristics that only CGI can provide. I had a couple of movie-related nightmares that night. My brother-in-law said he did, too. The next morning, I went to my sister's house to take my niece and nephew to Build-A-Bear Workshop. They're now one of my primary clients at work, so I wanted to go through the process of making an animal to see firsthand how it went. My niece, who is 7, chose a polar bear so of course my nephew (almost 3) had to have one, too. It was fun to watch them stuff the empty bear shell. I also enjoyed the heart ceremony where the kids make a wish on a satin heart and put it in their bear. As you can imagine,my nephew's version was a bit abbreviated. My niece was a Build-A-Bear Workshop veteran, so she helped guide my nephew through the process, although I think she encouraged a little more spending than I originally had in mind. Naturally, the kids wanted clothes for their bears, so my nephew ended up with jeans and a t-shirt for his bear and my niece got a little red skirt and a top with hearts on it for hers. I was glad I'd gotten them clothes because the first thing my sister asked me when I told her they'd gotten the same animal was, "Can you tell them apart?" Bear condos in hand, we went to the mall's playground for a while. I sat on a bench with the bears, coats and the kids' stinky shoes while they ran around. We stopped for a brief lunch in the food court, then went back to the play area until I realized that my nephew was past his naptime. After one stop for pretzels on the way out, I took them home and returned home myself. I spent the rest of the afternoon running errands with my husband before making tacos for dinner and going to bed right around 10:00 p.m. Ahhh. Today I need to get the lyrics for the nine songs we have lined up for tomorrow's band practice. It turns out my computer's CD drive has pooped out, so I can't burn the songs to CD and I'll have to listen to them in iTunes sitting at my desk. Then I have some work from last week that I didn't get finished, so I'll probably work for a few hours. It's nice and quiet in my home office, so I figure I might as well. Are you off work today? If so, what do you have planned?